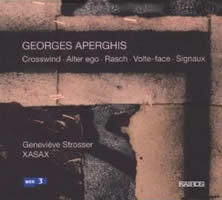 Georges APERGHIS: Crosswind (1997)1; Alter ego (2001)2; Rasch (2006, arr. Pierre-Stéphane MEUGÉ)3; Volte-face (1997)4; Signaux (1978)5. Geneviève Strosser1, 3, 4 (vla), XASAX: Serge Bertocchi1, 5, Jean-Michel Goury1, 5, Pierre-Stéphane Meugé1, 3, 5, Marcus Weiss1, 2, 5 (saxophones). Kairos 0012942KAI (http://www.kairos-music.com/). Distributed in the US by Allegro Music (http://www.allegro-music.com/). “Works for Viola Solo.” Georges APERGHIS: Volte-face (2001). Salvatore SCIARRINO: Ai limiti della notte (1979); Tre notturni brillanti (1974). Bernd Alois ZIMMERMANN: Sonate für Viola solo (1955). Gérard GRISEY: Prologue (1975). Anna Spina (vla). NEOS 10920 (http://www.neos-music.com/). Distributed in the US by Qualiton (http://www.qualiton.com/). The viola-sax combo works well, but then, this is Aperghis, who characteristically transforms instrumentalists into dramatis personae. Bubbling with perky repartee, Crosswind for viola and saxophone quartet suggests a barnyard at feeding time. Towards the close the players speak — I hear a Récitations quote near 10:30. Within the viola solo Volte-face’s continuously stalling stream fragments reappear, notes repeat, and there’s a recurring motif stolen from Strauss’ Don Quixote. As far as I can tell (you can see the score at http://www.aperghis.com/), there are no theatrical aspects to this lunatical solo. Originally a violin-viola duet, this version of Rasch, requiring dexterity and coordination, is for saxophone and viola. Crosswind’s vibrancy spills over into the tenor sax Alter ego. Signaux, the oldest item, has the sax quartet playing over two copies of itself. Aperghis’ works are generally immediate and frantic, quite unlike this early reflective piece. What are the odds that we’d have two shakes at one Aperghis opus? Spina’s rendering is a tad more rigid. I suppose Strosser lived with it a bit more. Both are distinctive, as if two actors playing the same character. The remainder of Spina’s program turns back the clock. What with its earnest atonality, Zimmermann’s Sonate might easily seem archaic, and yet, like Aperghis’ Volte-face, it skitters and jumps. The Grisey appears without electronics, limp microtones much in evidence. Sciarrino’s entries are routinely wispy and peripheral. Taken in its entirety, this program engages the viola’s capabilities. Mieczysław WEINBERG: Sonata for Clarinet and Piano, Op. 28 (1945, vers for viola and piano)*; Sonata for Viola Solo No. 1, Op. 107 (1971); Sonata for Viola Solo No. 2, Op. 123 (1978); Sonata for Viola Solo No. 3, Op. 135 (1982); Sonata for Viola Solo No. 4, Op. 136 (1983). Fyodor DRUZHININ: Sonata for Viola Solo (1959). Julia Rebekka Adler (vla), Jascha Nemtsov* (pno). 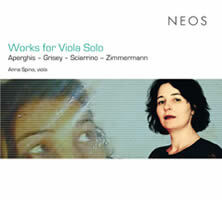 NEOS 11008/09 (2 CDs) (http://www.neos-music.com/). Distributed in the US by Qualiton (http://www.qualiton.com/). Weinberg (alternately known as Moises Vaynberg or Vainberg) was the only member of his family to survive WWII. Settling in Moscow in 1943, Weinberg befriended Shostakovich and the two visited almost daily. The best of Weinberg’s chamber music, operas and more than 20 symphonies stand just beyond his neighbor’s long shadow. Bach lingers in Weinberg’s four solo sonatas. Nos. 1 and 2 are four movements, No. 3 is cast in five, and No. 4 consists of three. Their durations vary: 25:44, 15:50, 32:55 and 20:17 respectively. Contrasted against the Op. 28 Sonata with its jazz / folk influences and the sad-waltz irony typical to some mid-century Soviet works, the four sonatas cluster episodic, character pieces. No. 3 ends with a colossal statement in its 5th movement more than a third the length of the entire sonata. Less bulky than its predecessor, No. 4 opens with a wistful folksong. Worth getting to know. Druzhinin became the Beethoven Quartet’s violist in 1964, and was the dedicatee of Shostakovich’s 1975 Sonata for Viola and Piano, Op. 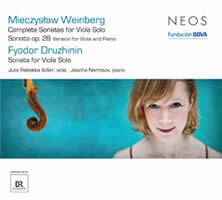 147, and Weinberg’s First Sonata for Viola Solo. The scherzo’s vigor matches Prokofiev’s symphonic efforts. No need to wonder where the rest of the quartet might be hiding: Druzhinin’s 17-minute four-movement opus stands well all by itself. Overall the Druzhinin is easier going; Weinberg’s four are more remote. Adler’s warm and luminous playing is superbly captured. I’ll have to track down another Neos where she partners with cellist Thomas Ruge. 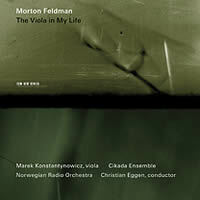 Morton FELDMAN: The Viola in My Life I – IV (1970-71). Marek Konstantynowicz (vla), Cikada Ensemble, Norwegian Radio Orchestra, Christian Eggen (cond.). ECM 1798 (http://www.ecmrecords.com/). An early stopover in my Feldman adventure was CRI CD 620 (now New World Records 80657) with classic performances of The Viola in My Life I, II and III led by the composer and featuring violist Karen Phillips with David Tudor, Paula Robison, Anahid Ajemian, et al. These doleful, elegiac pieces feature a viola standing alone, as if in the rain, afore a few instruments (I and II), piano (III) or orchestra (IV). Fresh Feldman releases are always welcome. Because IV requires a larger force, it’s probably a challenge to produce four parts under one roof. I’m only aware of one other recording of IV: Jesse Levine with the “June in Buffalo” festival orchestra led by Feldman colleague Jan Williams (EMF CD 033). ECM offers crisp definition and more aggression from its supporting players, though Eggen’s expeditious tour does note the mist and weighted sadness. Maybe if prior recordings weren’t lodged in memory, IV wouldn’t seem brisk. Indeed the Norwegian orchestra’s vividness and drugged Mahlerian gestures warrant a lower gear. Given the paucity of viola concertos, why isn’t IV programmed more often? We’ve met the Cikada Ensemble, and III’s pianist, Kenneth Karlsson, before. Why did ECM sit on this for so long? Perhaps they abandoned looking for a suitable companion to enhance this disc’s scant 40 minutes. 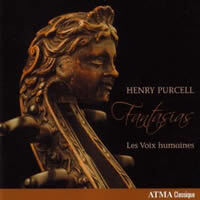 Henry PURCELL: The Complete Fantazias (1680). Fretwork: Wendy Gillespie, Asako Morikawa, Susanna Pell, Richard Boothby, Richard Campbell, Richard Tunnicliffe (viols). Harmonia Mundi HMU 907502 (http://www.harmoniamundi.com/). Henry PURCELL: Fantasies pour Violes (1680); The Fairy Queen: Dance for the Green Men, Monkey’s Dance; Dido & Aeneas: Dido’s Lament. Les Voix humaines: Margaret Little, Mélisande Corriveau, Elin Söderström, Susie Napper, Felix Deak, Arnaud Leroy, Marie-Laurence Primeau (viols). Atma ACD2 2591 (http://www.atmaclassique.com/). Distributed in the US by Naxos (http://www.naxos.com/). Harmonia Mundi’s indication of the four-part Fantazias’ composition dates, a period spanning June 10, 1680 to August 31, 1680, reflect the composer’s industry. Penning them at the age of 21, Purcell demonstrated prowess with a previous age’s concerns, much as Mendelssohn’s String Symphonies reflect upon his predecessors. The first three require three parts, the bulk of the series, IV – XII are scored for four. In the five-voice “Fantazia upon one note,” one viol sticks stubbornly to a middle C. Two In Nomines cap the collection, for six and seven parts each. Les Voix humaines offer Matthias Maute’s completed four-part Fantasia XIII. Overall, Fretwork takes slower tempos, offering honeyed restraint amidst a careful report of every note. The fleeter Les Voix humaines convey an antique feel though perhaps not the Restoration mold. The Canadian viols, marking the first professional recording of the University of Toronto’s predominantly 18th-century collection, play chordally, whereas Fretwork emphasizes contrapuntal majesty. Atma fills out the release with arrangements from Purcell’s operas. The Fairy Queen dances offer an intentional bit of discordance. I’m not quite convinced that Dido’s Lament works for tapering viols. Only nine years after the Fantasias, Purcell was in a different epoch. 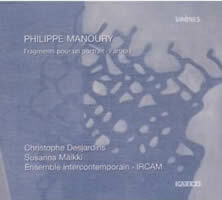 Philippe MANOURY: Fragments pour un portrait (1998); Partita I (2006)*. Christophe Desjardins* (vla), Ensemble intercontemporain, IRCAM, Susanna Mälkki (cond.). Kairos 0012922KAI (http://www.kairos-music.com/). Distributed in the US by Allegro Music (http://www.allegro-music.com/). “Alto/Multiples.” Paul HINDEMITH: Sonata, Op. 25, No. 1 (1922). Bernd Alois ZIMMERMANN: Sonate für Viola (1955). Luciano BERIO: Sequenza VI (1967). Gérard GRISEY: Prologue (1976). Emmanuel NUNES: Einspielung III (1982). Elliott CARTER: Figment IV (2007). Gilles BINCHOIS: Tant Plus Ayme (arr. Georg KRÖLL). Pierre BOULEZ: Messagesquisse (1976, 2000). Johannes OCKEGHEM: Malor me bat (arr. Bruno MADERNA). Wolfgang RIHM: Canzona nuova (1982/2006). Domenico GABRIELLI: Ricercare 1 (ca. 1688). Jonathan HARVEY: Ricercare una melodia (1984). Carlo GESUALDO: Madrigale X (arr. Christophe DESJARDINS). Ivan FEDELE: Elettra (1999). Christophe Desjardins (vla). Aeon AECD 0981 (2 CDs) (http://www.aeon.fr/). Distributed in the US by Allegro Music (http://www.allegro-music.com/). Continuously emitting virtuosic sparks, Manoury’s 40:57 Partita I for viola and computer maintains a stern demeanor across nine movements. The electronics recognize changes in the player’s acceleration and deceleration. 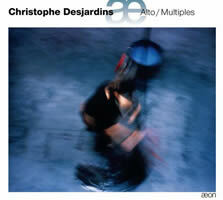 Desjardins whirls over a predominantly sustained background which midway adds percussive clicks. Not until the last section is the anchor jettisoned as harmonics enliven the viola’s tessitura. Is there a Partita II? For my part, I is enough. As much as I admire the technique required for the 30-person Fragments pour un portrait, the work passes like a cryptogram indifferent to decoding. The movement titles, Vagues paradoxales, Nuit (avec turbulences), Totem, etc., encourage an alignment of suggestiveness with sound. Chords and textures recall Stravinsky and Messiaen. It’s easy to set this music under the spectralist umbrella for its specific treatment of color and harmony. Desjardins’ Aeon survey offers a drowsy collection of viola solos and “multiples.” The roster tempts. However, those on the lookout for old friends are bound to be underwhelmed. The first disc dispenses several staples. I would not have expected Hindemith and Zimmermann’s sonatas to be nearly interchangeable. The Berio’s quadruple-stops are cool where violence is required. Desjardins’ earlier take on DG 457 038-2 is bolder. Carter’s terse Figment IV caps Nunes’ meandering stroll. Magic happens in Grisey’s Prologue where Desjardins plays against resonating electronics. Prologue is the cornerstone of Grisey’s seven-part Les espaces acoustiques (1974-85) and requires lowering the C string to B to spawn the E partials sprinkled across the movement. Springing from small figures gently tumbled, the piece grows aggressive until resolving uneasily. On disc two, the violist plays against copies of himself. Homogeneity doesn’t suit Boulez. Admittedly, I’ve never felt the occasionally programmed Messagesquisse and Dialogue are representative. The 32:15 five-voice Rihm is excruciating. Harvey’s gradually descending canon proves more interesting (trumpet and oboe play it here). I expected the arrangements to conjure timelessness as they had in Knox’s potpourri, however only Desjardins’ own realization of “Languisce al fin” from Gesualdo’s Fifth madrigal book transports. Fedele’s Elettra adds tape. Ken UENO: Talus (2007)1; On a Sufficient Condition for the Existence of Most Specific Hypothesis (2008)2; Kaze-no-Oka (2005)3. Wendy Richman1 (vla), Ken Ueno2 (overtone singer), Kifu Mitsuhashi3 (shakuhachi), Yuhio Tanaka3 (biwa), Boston Modern Orchestra Project, Gil Rose (cond.). BMOP/sound 1014 (http://www.bmopsound.org/). I listen to a lot of contemporary music and like to think I have it all figured out. And along comes Talus which greets us with a blood-curdling scream more appropriate to Hitchcock’s Psycho. Then follow Ueno’s overtone vocalizations akin to Tuvan throat singing. I admit it, I smiled. Three trips through this disc have dulled the surprises. Beyond the shock value and clever rhetorical gestures, the mild results don’t equal the multifaceted intents. Possibly I come to this music with my own baggage — I’ve thought seriously about Asian identities and composing (here and here). 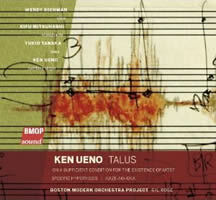 Perhaps Ueno reveals too much in the notes and the music falls short, despite BMOP’s commitment and intensity. Named for a bone in the foot, Talus concerns itself with violist Richman’s broken ankle. Scored for viola and strings, the work derives structure and spectrum from the opening scream and an X-ray of Richman’s fracture. Perhaps exposure to Lachenmann and Moe has dulled the novelty of heavy bow pressure. Such grinding effects require a purpose. Richman does deliver. On a Sufficient Condition borrows its title from a scientific paper by another Ken Ueno and embeds a tape of the young composer counting and signing. The amplified growls and overtones intrigue, but what do the childhood sounds mean? A memorial to Toru Takemitsu, Kaze-no-Oka refers to Fumihiko Maki’s buildings which incorporate ancient burial grounds. Ostensibly a double concerto for shakuhachi and biwa, the work has a clear two-part form: The orchestra yields to the soloists and never returns.